After working with thousands of companies, the Foster Institute knows the type of concerns that keep many business owners and top executives up at night. You know, those nagging thoughts about the IT security of your company. Do Any of These IT Security Concerns Sound Familiar? What if Our Network Gets Attacked? I don’t know if our firewall, network and anti-virus are as secure as we think. If he is angry, he could destroy my data, create a back-door for himself, or change all our passwords. What if Our Website Gets Attacked? Is it secure enough to withstand attacks from around the world? 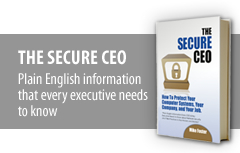 Are My Employees Compromising Our Security? Do they use mobile devices for work? What if the device got stolen? What if We Had a Data Breach? Would we lose our top customers? Could it take our business down completely? Why Does IT Seem Like a Black Hole, Using Up Money with Little Return? Is my outsourced IT company taking advantage of me? Are they really doing their job? What if We Lose Out on New Clients Because We’re Not Compliant? Do potential customers require us to meet specific IT standards? Are we compliant with all the laws and regulations that apply to us? You put everything into your business and invest the better part of your day into ensuring that your company succeeds. You shouldn’t have to lay awake at night worrying about concerns like the ones above. Mike Foster, Certified Ethical Hacker, Certified Information Systems Auditor, and Certified Information Systems Security Professional, of the Foster Institute can help you protect your business and solve challenges your in-house and/or outsourced IT professionals are facing. Put your IT concerns to rest , find out more about our IT security services, or contact Mike Foster directly at (707) 200-2095 to discuss how he can help protect your business!